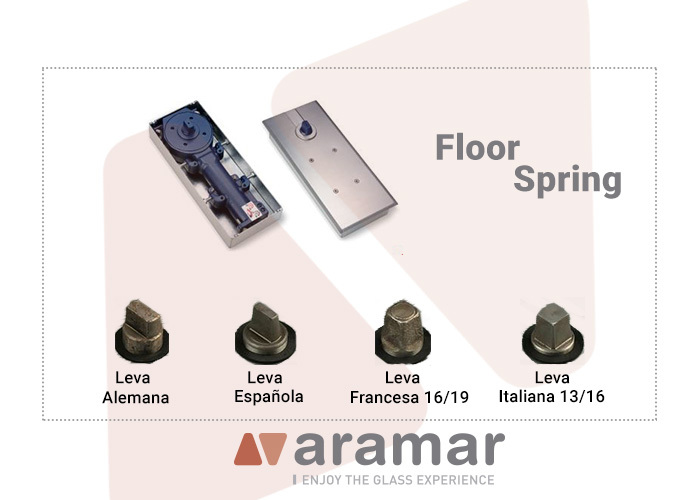 One of the main needs of customers Aramar – Suministros para el vidrio are usually fittings for glass doors, including floor or floor spring closers. Today we are going to focus on this product, looking at its advantages and features, as well as those you can find in the catalogue. Floor Spring are those accessories that are installed for swing or swing glass doors. They are the perfect solution to avoid doors slamming and therefore damage to the glass leaf. They usually have a discreet appearance and great functionality to create doors without elegant hinges for commercial use or homes. For its installation it is necessary to create a box in the floor in which to install the mechanism that will be joined to a low hinge, which will be installed in the glass. Subsequently, the door closer is covered with a lid, thus remaining discreetly camouflaged on the floor. The choice of this type of accessory must be considered, since the weight of the glass leaf comes into play, which must be calculated with the dimensions of the leaf and the thickness of the glass, you can use the glass calculator available from Aramar, and the type of mechanism you choose which must be in accordance with the hinge installed on the glass directly, to be coupled simultaneously and have a proper functioning of the door. You will be able to find different types of door closers in our catalogue, and if you have any queries, you can contact us by telephone or via email. We will be happy to help you.